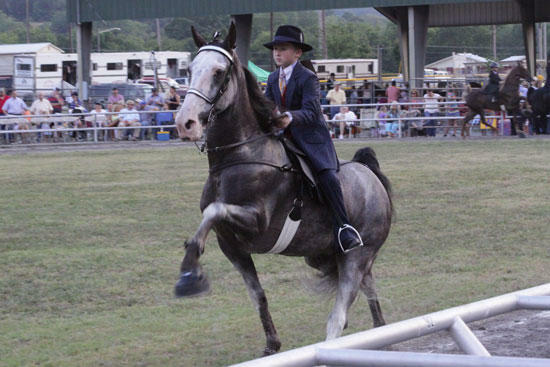 Nathan Oliver rode A Cloudy Sky to victory in the Youth 11-under category at the 2012 Woodbury Lions Club Horse Show. Sweltering heat and being in the midst of a record-setting drought created concern for organizers of the 74th Woodbury Lions Club Horse Show Saturday (July 7), but tradition won out as the event drew in excess of an estimated 2,000 fans and more than 300 entries. Jimmy McConnell, who has enjoyed success at the Woodbury Lions Club Horse Show in recent years, continued his winning ways on He’s Slim Shady, by winning the TWHNC Walking Horse Stake. He’s Slim Shady is owned by Bill and Karen Bean. He’s Slim Shady was one of more than 300 entries who made the annual event another exciting venture for the Woodbury Lions Club. There were six or more entries in 29 of the 36 classes. Of those, 17 classes had at least eight entries. 2. Roll The Gold, Allison Thorson, Thorsport Inc.
3. Dos Equis, Chad Williams, Thorsport, Inc.
5. Jazzs Johnny Red, Clinton Gribble Jr., Clinton Gribble Jr.